Includes a separate section on disease management which covers integrated pest management and genetic modification. In this Compendium of Tobacco Diseases we have assembled current knowledge on the nature, identification, and management of tobacco diseases throughout the world. It should be useful as a practical reference and resource for growers, students, researchers, educators, and personnel in agribusiness, extension, and government. Major emphasis is on the correct identification of diseases of tobacco; for this reason, numerous illustrations, black and white and color, are included. Life cycles have been illustrated to aid in understanding how diseases develop within a growing season, and a brief discussion of the epidemiology of each disease will help users of the compendium understand why certain management practices are recommended for a given disease. Tobacco is grown for commercial purposes in at least 97 countries around the world. Although tobacco is of tropical origin, current production of most types is concentrated in the temperate zones. Total commercial production of tobacco on approximately 4.3 million hectares, with almost one third of total production in China. Other major tobacco-producing countries in 1988 included the United States, Brazil, India, and the Soviet Union. Development of the commercial tobacco industry began in the Americas. The use of tobacco for smoking and chewing was apparently widespread among natives of North, Central, and South America by the 16th century; the earliest record of tobacco use is a fifth-century bas-relief from Mexico. 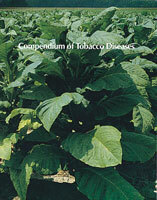 Nicotiana tabacum L. was the principal tobacco cultivated by the natives of Central and South America. The most widely grown and used tobacco in eastern North America at that time was N. rustica L. This species was also introduced into countries around the world by Portuguese and Spanish merchants and was of major commercial importance for many years. It is now commercially important in only a few countries, with the greatest production in India. The tobacco industry as we know it today began in 1612, when seed of N. tabacum was introduced into Virginia from the Orinoco region of Venezuela by the Englishman John Rolfe. Smoking material made from this new, flavorful tobacco was more palatable to smokers than harsh, bitter smoking material made from leaves of N. rustica, and it very quickly became the most important export crop of the fledgling colonies. Other early centers of commercial production of N. tabacum include the Caribbean area, South America, and the eastern Mediterranean. Today, the commercial tobacco industry is based almost entirely on the many types of tobacco leaf found in N. tabacum.